It all started on a trip to Napa. I fell in love with an artist, Ira Yeager, whose paintings filled the walls at Swanson Vineyards. I mentioned all of the above in my very first post here. The paintings were whimsical and french themed with interesting characters carrying wine barrels and pots, and charming ducks and chickens scattered about... 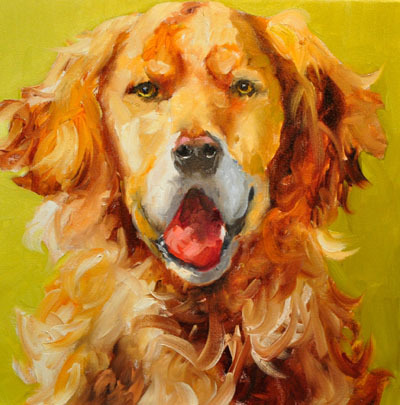 While shopping, still in Napa, at Napa Valley Vintage Home, we spotted a wonderful painting, and as we got closer, we realized the artist was none other than Ira Yeager... 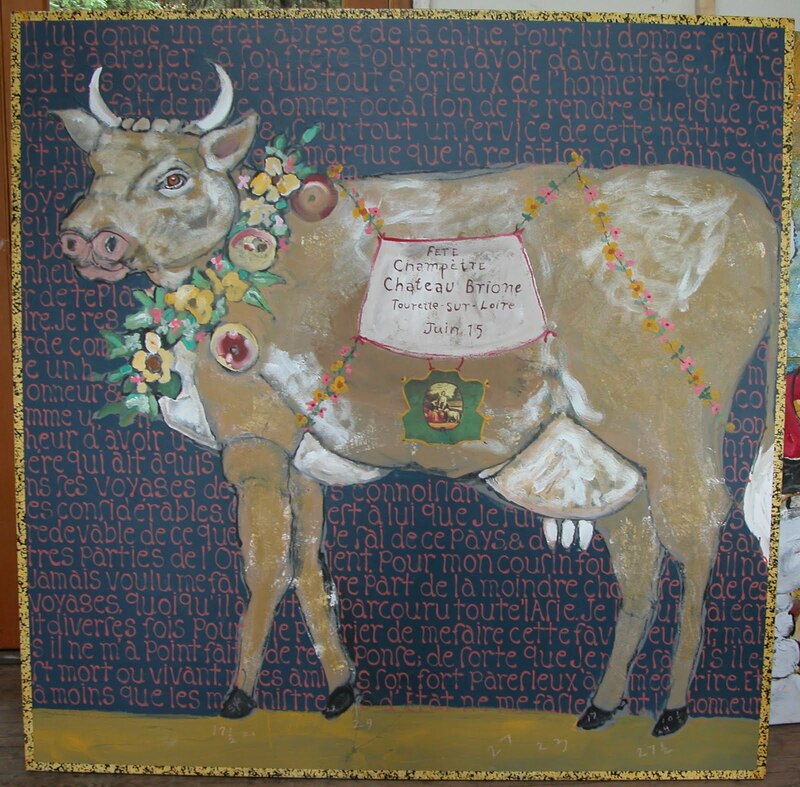 Same french theme, a charming cow decorated with bells and flowers, plus charming frogs and other critters dotted the large (60" x 60") warm, mustard and terra-cotta hued painting. I convinced my husband in a fairly short amount of time that this painting would change our home completely! It would give the living room a whole new look - like straight from the countryside of France! 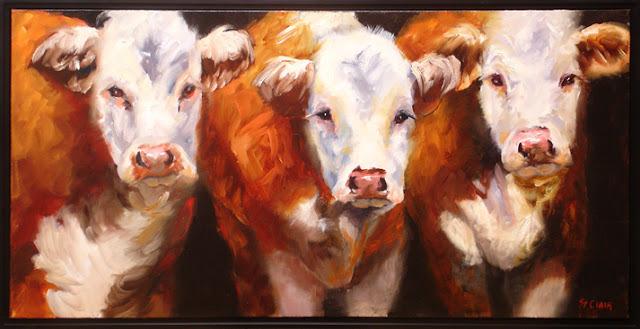 Replacing our contemporary painting with this old world, french (very french) cow would make the wood beams and the brick floors all make sense. Of course, when we returned to purchase the painting after making the extreme decision to drastically change our living room, the painting was sold. So interesting and charming aren't they? I saw this one in Beaufort by a local artist... I'm so sorry I can't find/remember her name! 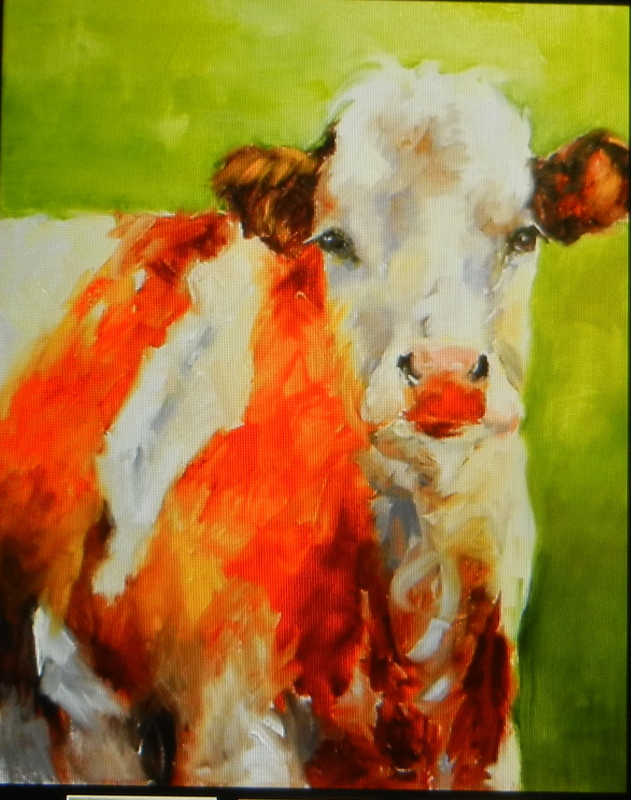 While helping my friend Ann move, I was reminded of a cow painting I had admired in her home for years. While unpacking and placing hers, I gathered the information regarding the artist, Linda St. Clair. Linda St. Clair + Google = surprise! This was not the only painting with cows.... In fact, cows are kind of her thing! Along with many other animals... farm and wild... and they are simply spectacular! This one reminds me of Ann's! Here are some more of her beautiful animal portraits. 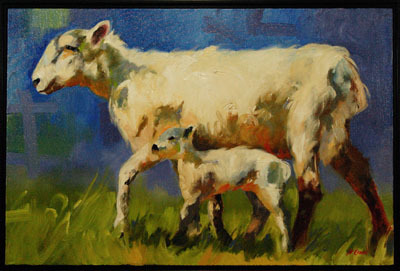 Linda St. Clair images above are from Trailside Galleries. Don't you love her titles? St. Clair creates her paintings - even large ones - in a single, intense session out of her studio in Santa Fe. What a talented woman! I can sense the personality of each animal she portrays... I wonder if she comes up with the title first, or waits to see what the painting looks like and names it accordingly? I feel pretty confident that I have searched, found and viewed every painting by Linda St. Clair available on the web... each one more beautiful than the last. I corresponded with Linda via email inquiring about "Beautiful Brown Eyes" keeping my fingers crossed the size would work for my family room. 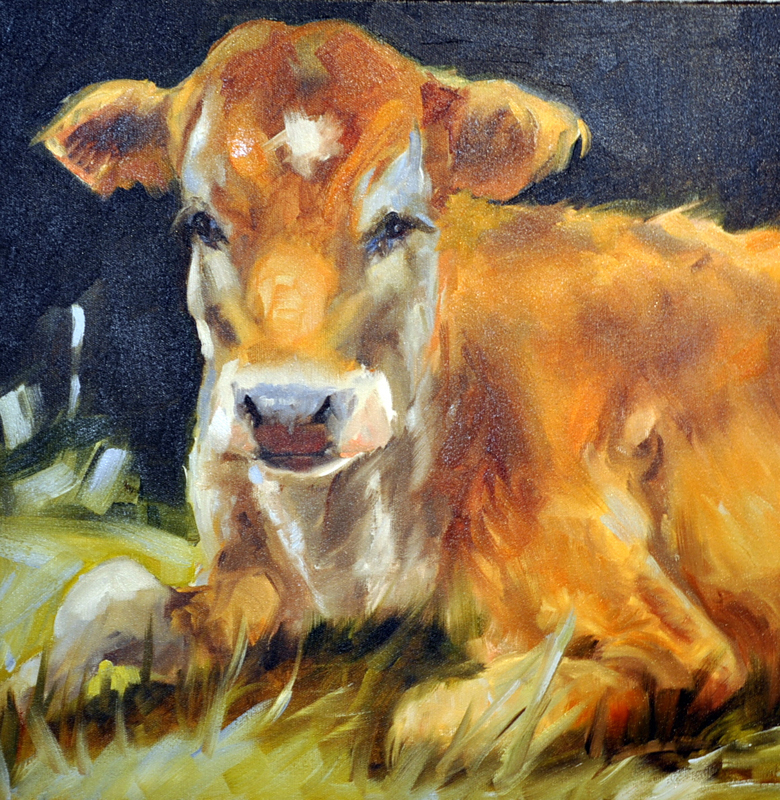 This is not the original space intended for a cow painting, but hers are a bit different than the original cow idea, and I thought the family room might be the perfect home for "Beautiful Brown Eyes"... I was so disappointed to find out the size was not right, and with the other exciting additions I've been working on in my home, the cow painting wasn't going to happen. Oh how I wish I had room for all the lovely things I find! 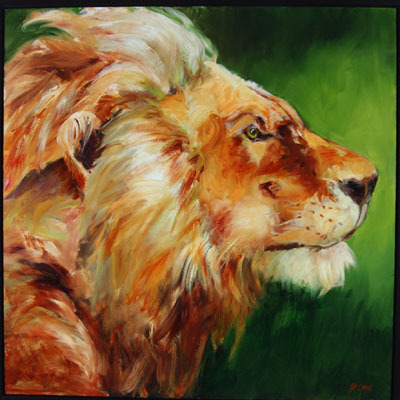 Visit Linda St. Clair's website here, or a myriad of other websites featuring her work including Trailside Galleries and Morris &Whiteside Galleries, to see more of her outstanding collection. "St. Clair’s paintings are exhibited and collected throughout the nation and worldwide. She is a two-time recipient of the Grumbacher Gold Medal and member of the Society of Animal Artists in New York. Her work is featured in galleries in Sedona, Arizona; St. Helena, California; Beaver Creek, Colorado; Ketchum, Idaho; Hilton Head Island, South Carolina; Washington DC; Jackson Hole, Wyoming; and her home city of Santa Fe." These fabulous pieces of art, I love. 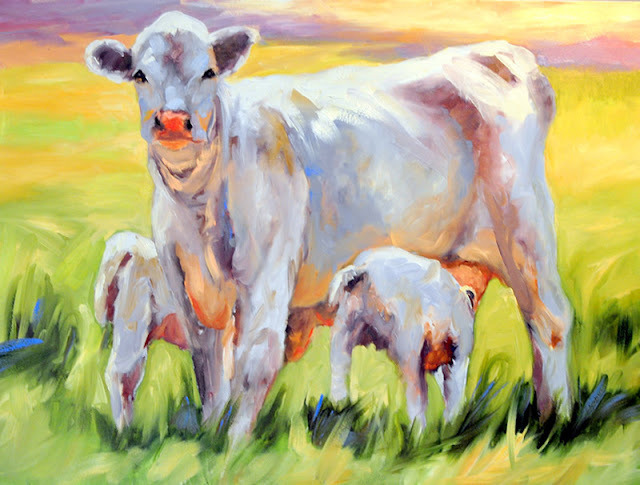 Definitely very talented and I am with you, those cows are really something! The eyes are so beautifully done.....and her use of color is wonderful. Thanks for the introduction and I so hope you get your painting! 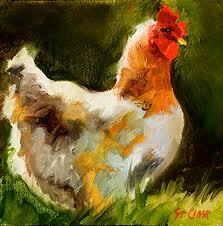 Those Linda St. Clair paintings are beautiful! Can't decide which is my favorite. These are amazing... yes If we could find space for all the lovely things we find... Blogland obliges beautifully. Them cows is enough to change me from a rooster gal to a cow gal! The three ladies together is my fav. I love these works of art and you must have an Ira Yeager!! They are wonderful and as you say so French, perfect!! Have you thought about commissioning one? 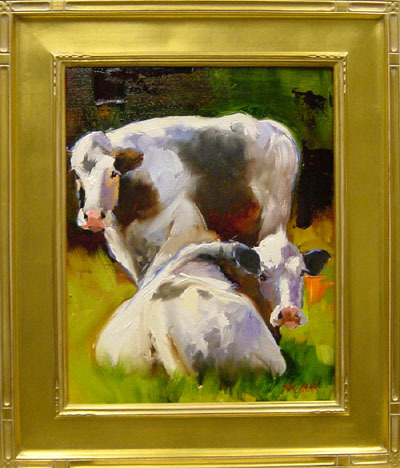 I love these cows and would love to have a painting like one of these some day. Thanks for coming by! You must check out my friend Valerie Hinz, a Canadian artist. Beautiful scenes of western pastures and cattle. It's been such a long time since I read your post about Linda St. Clair. Since then, I have continued to look at her work on line. Finally, last week, I purchased one of her paintings. I am entirely smitten with one called "Getting Out of the Blues". It is a lovely work with a gold / cream bunny on a blue background. Thank You so much for introducing me to this amazing artist. I can't wait until the painting arrives from the gallery. I'm sure it will make my home all the more special. Fly Away Home: I could not be happier to hear your good news! Please, would love to share a photo with readers of your new addition when it reaches it's new home! Thrilled to pieces that I was able to help you find something beautiful for your home!